Use this tool to visualise the different ways a person might involved with your campaign, from the lower commitment activity of observing and endorsing to taking up active leadership. 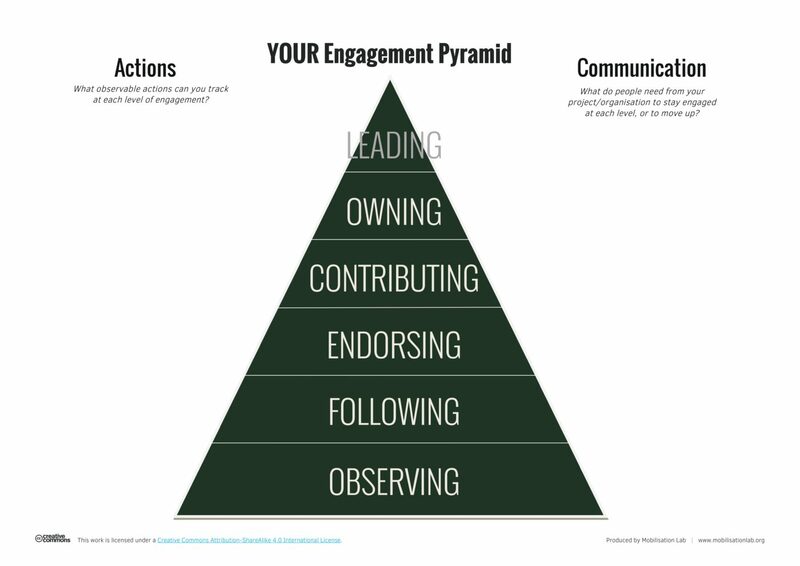 The Engagement Pyramid is a tool that enables us to map how people can engage at different levels of “depth” in our campaign — and recognise that more people are likely to engage when the level of commitment required is lower. You can also use the pyramid to work through how you might “level up” people and to ensure that you’re adequately catering to people who are willing to commit in different ways. Try not to get too caught up in the specific categorisations; you can use those as helpful prompts, but what a low-, medium-, or high-level of commitment for one organisation or campaign is could be very different for another.